Music Tubee by MobiRocket is a YouTube top 100 music chart video compiler. First of all, Music Tubee will save you hours of searching around on YouTube for the right music video to listen to. The top 100 music chart videos are all there Â in a convenient list form, sorted into categories of music types, with the option to view an artists list or search for a specific track. Have you ever tried to search YouTube and save videos into playlists? You’ll know that this takes up valuable time. You have to sort through all the junk and it’s pretty hit and miss as to what you may find. The good news is that Music Tubee takes on the role of searching for you. When you open the app, the top 100 list in a whole host of categories populates and you have to just simply click on your chosen track. This app is free to download and gives you thousands of artists to choose from. You can loop, shuffle and set the mode to continuous from within this app with a background playback option as well. I can honestly say that this this app has saved me a lot of time already, because my favourite music videos are there to hand. I now often click on my favourite category ‘Alternative’ and check out some of the latest music video releases. There are categories for any type of music you are interested in. One thing I noticed when using Music Tubee is that each video is so much faster loading on my device, an iPod Touch, than when I open up videos on YouTube from my Mac or PC. There is airplay support and you can arrange your favourite videos into playlists all from right within the app. There is a 10 second rewind option and the ability to save search keywords, view a history of videos watched and share your favourite videos on Facebook and Twitter. I’ll Â be totally honest and admit that I don’t have the time to keep up with the latest music that is released, but this app gives me a quick look and selection option to sample music when I’m on the move or working. In a nutshell, this app can help people who don’t have the time to spend searching for music videos. All the latest videos are right there for you to explore with no time wasted in searching. You can skip to the next song or go back to a previously viewed music video and you can also pause or start videos using your earphones. When I first opened the app I had no trouble navigating around. It’s all clearly laid out and similar to the user interface experience that you’d find on YouTube, but simplified and neatened up even further. The app is a joy to navigate around and to use. The developer hasn’t added any unnecessary complications to the user interface. The navigation is clean and simple. When you play a music video it will initially appear in a minimised format on the display, which is great for if you just want to listen to music by ear. If you want to watch the video to the song in full you can click on the expansion button to view the video at full size on your device. There are some ads on the app, which is no big deal as you can always choose to upgrade to the paid version, which is not expensive, only a few dollars. I upgraded to the paid version and it was well worth it. There are advantages to upgrading to the paid version, the biggest advantages being that the ads disappear and you can then play music videos in full HD. Because it is so easy to navigate between categories and sample music I found myself exploring new categories in music that I previously hadn’t given a chance, such as classical music, country music and world music. Great fun. A nicely laid out and easy to use interface. The ability to share your favourite music videos with friends and at the end of the day this app saves you so much time. You can keep up with the latest music releases easily. You can even workout to music as there is a workout music category within Music Tubee. This app does what it says and it will be such a useful and fast tool for music lovers. I can’t think of any obvious improvements. I would like to suggest to the developer to research other popular categories that people most often view on YouTube, such as movies, movie shorts and classic series. The reason being is that a lot of people would welcome an app that compiles the latest movie shorts or documentaries for example. This kind of app saves people a lot of time. I like watching retro TV shows for example and it takes me time to search for a good video. The developer will already have the root template for this kind of app, so the possibilities for spin-offs and variations of the same kind of app, displaying different video themes, might be a niche area to explore when planning the next app project. 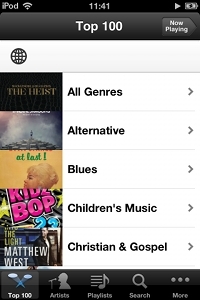 Music Tubee is an awesome app, a time saver and will be loved by music fans. Busy people on the move will also appreciate Music Tubee, releasing their time to get on with life and let Music Tubee take care of compiling, searching and keeping up with the latest music videos. I’m going to keep this app on my device permanently and also use it for when friends come around for a BBQ even, as I just have to open up the app and it gives me a constant stream of music, with my choice of categories or playlists to suit the mood and occasion. Give it a go, it’s free so you can’t lose anything! I guarantee most people will be so impressed that upgrading to the full version will be seen as a bargain.